The licensing of HVE-2D system software, physics programs and databases can either be controlled by "locking" to a code specific to a single computer, or to a portable hardware dongle called an EDKEY. The EDKEY provides the flexibility to use the software on multiple computers, such as a desktop and a laptop. Simply plug the EDKEY into the computer that you wish to run the software on, and the application is "unlocked" for you. This flexibility makes it easy to share copies of the software between users in an office, or provide the ability to work on computers at your office, your home or while traveling. 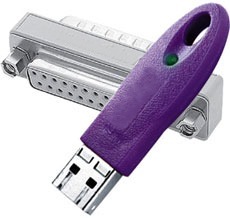 EDKEY's are available in USB style, which is supported on Windows XP, Windows Vista and Windows 7 operating systems. This style is fully plug-and-play and provides great convenience if there is easy access to USB ports on all your computers. When purchasing your software, please specify if you will be "locking" HVE-2D to a single computer or if you will be choosing a USB style EDKEY.